This week, let’s run a weekend poll! Chloe and Marc Jacobs fragrances have an on-going promotion at KLCC until 28 September where you can match your favourite flower to a Chloe or Marc Jacobs fragrance. This is based on the notes and association with the scent so Roses = Chloe, Violets = Love Chloe, Daisies = Marc Jacobs Daisy and Peonies = Marc Jacobs Oh Lola. 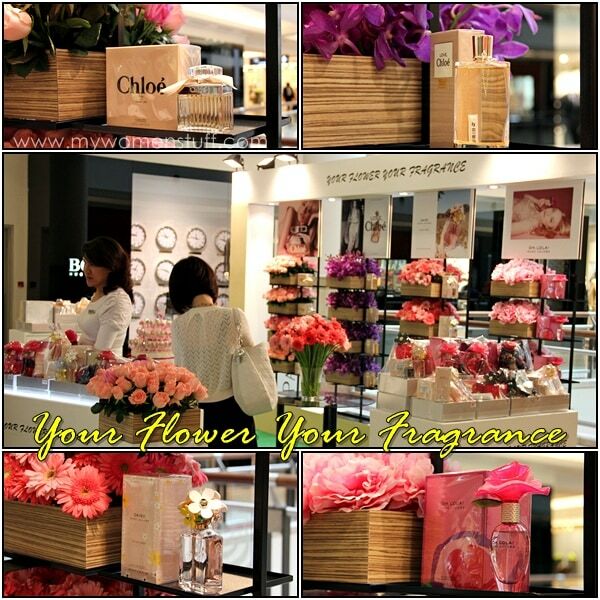 With every purchase of a fragrance from the booth, there will be chocolate lollipops and flowers to be given away. Incidentally, Love Chloe and Marc Jacobs Oh Lola are new fragrances so go and take a sniff at them, even if you don’t buy anything. I have Marc Jacobs Lola and I personally prefer the scent to Daisy as its a little heavier. Perhaps not as memorable as some scents, but its not too bad for a department store scent. While we’re on the subject of flowers, what’s yours? Its so hard to choose favourites, urgh! I paint myself into a corner every since time I do this but I’d probably say Lilies. I sometimes buy Stargazer Lilies for my house. They last long, look regal and fill the room with a natural sweet scent that beats any home fragrance. Do you prefer light, fresh fragrances or stronger, heavier ones? What your favourite smell ever? Do you prefer light fresh scents or stronger heavier ones? What is your favourite smell ever? PREVIOUS POST: Newsflash: Kiehl’s celebrates 160 years and goes to Kuching, Sarawak! Sewing small stuff = no sweat. Ask me to sew a straight line though and I’ll ask you to just send it to the tailor. Roses, especially David Austen ones. 2.Do you prefer light fresh scents or stronger heavier ones? Light and fresh, I get hayfever and headaches from heavy ones. I love Bvlgari au the vert. 3.What is your favourite smell ever? The scent in the lobby of the Grand Hyatt, Singapore. Yes, but much better at cross stitch and decorative sewing than taking hems up. I can use a sewing machine. No! I can’t even eat durian ice cream! 1. Pink african daisies. They look so chirpy! 4. Yes … at least well enough to mend hems and sew buttons back on. 5. I used to when I was younger but not anymore. Somehow as I get older, my sense of smell seem to get more acute until the scent of durian is now too much for me to handle. If ever they manage to make odorless durians, I’ll be first in line because I love the taste! oooooh! I preferred the pale and slightly bitter ones over the golden sweet ones too! I’m not really into flowers but if I had to pick one, it would be orchids. Growing up, my parents used to have several orchid plants and they were beautiful. I do prefer lighter scents in general because the heavier ones tend to get too cloying after a while. I’m currently using Guerlain Aqua Allegoria Tiare Mimosa, which is sadly discontinued. I’ve been stocking up whenever I can. Another favourite is Origins Ginger perfume. I like slightly musky florals. I love the blend of lemongrass and rose. This reminds me I need to get the oils for my burner. I can knit but my sewing skills are somewhat lacking. I don’t know how to use a sewing machine. I have a bunch of pants that require the hemming on the right leg to be fixed. They’re all from the same brand and honestly, there’s something wrong with the QC. Nope. I stay away as far as possible. Haha we can both stay away from durian eaters then 😀 I’m loving my Guerlain Aqua Allegoria fragrance that I picked up recently. Its beautiful! 😀 Lemongrass and rose smells would make your house smell like a balinese spa – lovely! 2. Do you prefer light fresh scents or stronger heavier ones? 3. What is your favourite smell ever? 5. Do you eat durians? Camellias! And not because of Chanel! 😛 Love the intricate layers, though it’s so hard to find in Malaysia! I went to a few florists, but none of them stock camellias. 🙁 At this point, I don’t even know if it can be found in Malaysia. NO. It’s not the smell that puts me off, but the soft, mushy, squishy texture….ew! Daisy, white daisy to be exact 🙂 My aloe vera were flowering recently & I quite like it too. Too bad one only flower once. I don’t wear scents (allergy to fragrance) but I like light, fresh & citrusy ones. Aloe Veras have flowers? I didn’t know that! We used to have aloe veras at home but I guess I just never noticed if they flowered 🙂 Yay for being a coffee drinker and boo for eating durians LOL! But I do have to agree with you that a fresh durian from a freshly opened fruit has its attractions. It always tastes much better than the prepacked or “durian flavoured” incarnations. I didn’t expect it to bloom either, but I was thrilled! But the flower didn’t last long..
What’s your favourite flower? Giant blooming cream roses. Do you prefer light fresh scents or stronger heavier ones? Light! What is your favourite smell ever? Annick Goutal Hadrien scent. It smells like skin. Can you sew? I have my limitations. I can fix buttons and mend a tear. Do you eat durians? Not really. 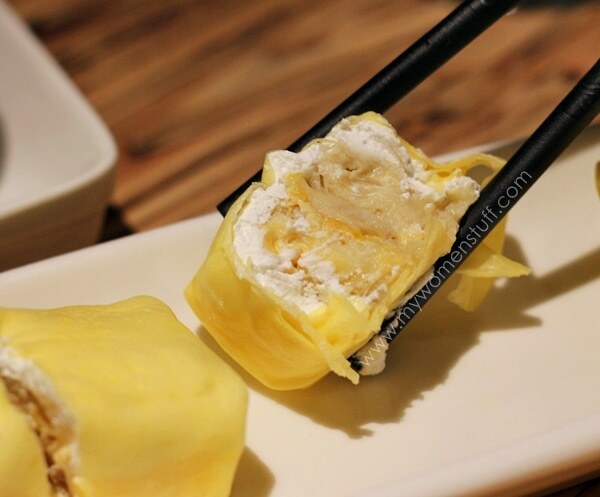 5. yes i eat durians, but i don’t look for them! Ah I should send my sewing to you 😛 I have to agree with you about lilies being a little cloying. I usually only have about 3-4 at any one time. I like them light and fresh. Perfume-wise I like them leaning towards fruity, as they seem to match my bodily chemistry more, though stronger heavier ones do too, but they seem to be overkill unless it’s a formal occasion. Hence my favourite perfumes are Lancome Magnifique, Gwen Stefani Harajuku Girls Angel, Vera Wang Rock Princess and Marc Jacobs Daisy Eau So Fresh. Not in the fruit form, only when presented in dessert form, just like you haha! 😀 I don’t hate it, though. Freshly cut grass, for some reason. And… freshly baked Rotiboy. Only to salvage stuff like zip hooks, pockets and whatnot. *five* me love lilies too! Oh yes yes! Will rsvp once the date, venue and time confirmed in due course 😀 Yay! Freshly brewed lemongrass drink. I make this drink every weekend! Yes. My favorite indeed. I can eat cups and cups of durian puree. Hehe. I am not very sure about the health benefits of this drink. But I heard it helps to detoxify, especially after we eat oily foods. Haha. Different people make this drink differently. Do you eat durians? OMG NO! I am Japanese! My fav flower is the rose….cliched i know, but i love roses! pink, white, blue, black…thats why i heart Anna Sui’s packaging AND the scent she puts in all her products. My favourite smell ever – hahah. Rose! everything i use is rose, Chloe, my facewash, my toner, my moisturizer, my Anna Sui mascara, my Fuirts of the Earth ALoe with Rose extract, my Velvet Rose shower gel from Sasa…. I think i am right in the middle with this. i like middle scents! not too heavy, but not too light either. I cannot sew, but i can darn. i hate sewing. nope, i neither love nor hate durians. i dont mind if i never eat them again for the rest of my life, but if you offer me a piece and im in the mood i dont mind eating it either. weird huh? i must be the only person in the world who’s on the fence about it. its usually a love or hate thing. Yes I remember you and your roses 😀 I do like the smell of roses but some can get really cloying. Those that use the fresh rose scent usually do it for me but the powdery rose scents turn me right off! In term of smell, I love Lilies and roses!!! And in term outlook, I prefer Sunflower, by just looking at it, it makes my day! Lemongrass, Rose and smell of my hair after hairwash! Yes, now I miss my snowskin durian mooncakes ! YUM! Lavender. Which is why I’m trying to grow multiple species of lavender in my backyard! 1. Favourite flower: It’s a toss up between lilies (I love stargazers too) and strelitzia which I always use for flower arrangements. 2. Light scents anytime. My favourite used to be Murasaki by Shiseido (long discontinued….why??? ), so now I settle for Romance by Ralph Lauren. 3. Favourite scent: The smell of my children’s baby hair from oh-so-long-ago. 4. I love sewing – need any help with your alterations? Cross stitch is like child’s play but knitting and crocheting don’t interest me. 5.Hey! I’m a true blue Malaysian, so bring on the durians! i don’t have actually, but if really need to pick, i’d go for roses and lilies, stargazers are my favourites. i like both, depending on occasion, but i go for light fresh scents normally. green tea scents are my favourite right now! light fresh florals. johnson’s baby shampoo. on a side note, i dislike, maybe even hated the Pureen baby powder. buttons yes, anything else, no. not quite. i rely on tailors and my mother, if i desperately needed her help. yes, but not much of the raw food. give me the pancake or crepe i’d take. i like my berries much much better!